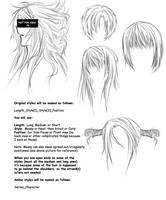 Just thought it might help people wanting to try different ways of drawing hair? You just save my life, because I really needed this! Thank you! I've been looking for something like this! Thank you! I do love the short black hair look. So many styles. so many references. this will do greatly. wow.... nice hair styles. really, they're really cool... I'm gonna go to your charts... lol. thanks!! now i can sit nicely and do some haircuts! I know you can figure out the hairstyles I used there. Hope you don't mind. And can I used your other hairstyles references to my future art projects? Amazing hairstyles! Well done, Neon! I've been wanting to get my hair cut this length for a while. And now I'm defiently gonna do it! i like this. i wish this is also applicable to real life. Thank you so much for this insparation, i finally found the perfect hairstyle for my drawing! Oooh one of my coworkers has a haircut like that. it's amazingg what short hair can do. I'm trying to draw my own anime people but they end up having the same hairstyles so I'll use this as a reference to get out of my habit. Congratulations on the DD! This awesome! This helps me a lot! Thanks! well it's not really a DD, it's justv somehow managed to get enough pageviews to be popular for a little bit LOL. Well, I think that's still pretty special! Haha! Wow! I've been looking through your gallery and you have a lot of helpful stuff! OMG that's my hair style. Not kidding! check out my id! Wow thank you for making this. I'm sure that many people will be able to use this as reference! Hairstyles among other things is what I need to work on. Awesome! I love drawing hair.